We’d love your help. Let us know what’s wrong with this preview of K-9 Defense by Elizabeth Heiter. he’ll have to brave treacherous territory. To ask other readers questions about K-9 Defense, please sign up. Can Kensie Morgan find her sister who was kidnapped 14 years in the Wilds of Alaska? Can an injured former Marine Colter Hayes, with his partner dog Rebel, find himself while helping Kensie in the wilds of Alaska? Are they both on a losing path to heartache? Strong determined characters with do-not-give-up attitudes grab you by the heartstrings and don’t let go until the end. Kidnapped. Was the note a hoax? She didn’t think so. She had to find out one way or another. What she found was trouble and Colton Hayes with his dog Rebel. It wasn’t a great introduction and she wasn’t sure he would believe her anymore then the FBI and police did. They wanted her to give up, and put it all behind her. She needed his help along with Rebel’s. Colton and Kensie bought loved and lost. Blaming for a mistake they had made which there was no way they could control. See what happens and buy the book. So good! 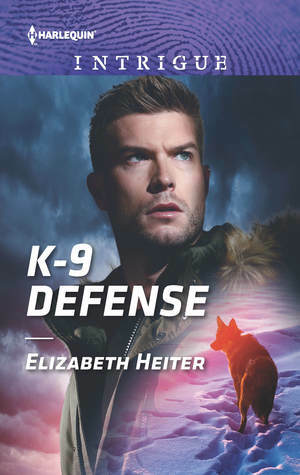 K-9 Defense by Elizabeth Heiter is a fast-pasted romantic suspense set in rural Alaska. Kensie Morgan has never given up searching for her younger sister, Alanna, who was kidnapped at the age of five. After learning of a note which is purported to have been written by Alanna, Kensie rushes to the small Alaskan town in hopes of finding her. Unprepared for the harsh weather conditions and isolated area, she cannot be dissuaded from her search for Alanna. Meeting reclusive Colter Hayes is a stroke K-9 Defense by Elizabeth Heiter is a fast-pasted romantic suspense set in rural Alaska. Kensie Morgan has never given up searching for her younger sister, Alanna, who was kidnapped at the age of five. After learning of a note which is purported to have been written by Alanna, Kensie rushes to the small Alaskan town in hopes of finding her. Unprepared for the harsh weather conditions and isolated area, she cannot be dissuaded from her search for Alanna. Meeting reclusive Colter Hayes is a stroke of luck but even with his assistance will she find her missing sister? Wounded in action, Colter moved to the remote Alaskan town in order to recover from his wound and grieve the loss of his brothers in arms. Away from the hustle and bustle of city life, his PTSD and panic attacks are now under control. With only his combat mission dog, Rebel, to keep him company, Colter is surprised by how quickly he adjusts to having Kensie by his side. Despite his misgivings, Colter nonetheless assists Kensie throughout her investigation. Kensie's and Colter's search for Alanna is a bit of a slow starter since the townspeople have a live and let live attitude. Kensie soon becomes convinced they are on the right track but local law enforcement is uncooperative. Many of the people live off the grid and fiercely protect their privacy. Kensie crosses paths with a couple of people she believes could help her find Alanna. When she finds herself in dangerous situations, will Colter rescue her before it is too late? A wonderful read. Beautifully written. Very engaging. Grabbed my attention and didn’t let go until the end. A lot of emotions, from Colt, Kensie, and of course Rebel. A completely different setting from Elizabeth Heiter’s previous books, Alaska. And even the setting plays a role due to the harshness of the weather. I didn’t want to put the book down once I started. I had to have the answer, would Kensie find her sister? Kensie goes to Alaska to find her sister that has been missing for years. Wh A wonderful read. Beautifully written. Very engaging. Grabbed my attention and didn’t let go until the end. A lot of emotions, from Colt, Kensie, and of course Rebel. A completely different setting from Elizabeth Heiter’s previous books, Alaska. And even the setting plays a role due to the harshness of the weather. I didn’t want to put the book down once I started. I had to have the answer, would Kensie find her sister? Kensie goes to Alaska to find her sister that has been missing for years. When she arrives in Alaska, she runs into Colt, who could help or hinder the search. The plot thickens, what will happen? Wonderful suspense with both the search and the relationship. Definitely one you do not want to miss. Waiting for the next one. ELIZABETH HEITER likes her suspense to feature strong heroines, chilling villains, psychological twists, and a little bit (or a lot!) of romance. Her research has taken her into the minds of serial killers, through murder investigations, and onto the FBI Academy’s shooting range. Her novels have been published in more than a dozen countries and eight languages; they've also been shortlisted for th ELIZABETH HEITER likes her suspense to feature strong heroines, chilling villains, psychological twists, and a little bit (or a lot!) of romance. Her research has taken her into the minds of serial killers, through murder investigations, and onto the FBI Academy’s shooting range. Her novels have been published in more than a dozen countries and eight languages; they've also been shortlisted for the HOLT Medallion, National Readers' Choice, Daphne Du Maurier and Booksellers' Best awards and won the RT Reviewers' Choice award. Elizabeth graduated from the University of Michigan with a degree in English Literature. She’s a member of International Thriller Writers, Mystery Writers of America and Romance Writers of America. You can also find Elizabeth on Facebook at www.facebook.com/elizabeth.heiter.author and on Twitter @ElizabethHeiter. “She had no idea what she was asking. If he tried to help her, he knew what would happen. He'd have a mission again. A reason to reconnect with the world.